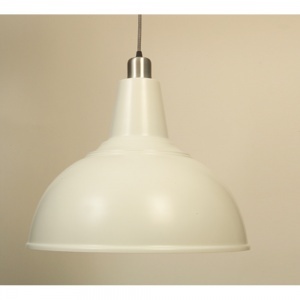 Our range of retro style kitchen light fixtures are made here in the UK and available in a wide choice of colours. 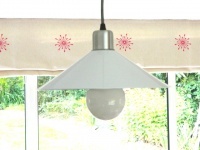 We have a number of retro kitchen shades to suit all sizes of kitchen or dining area. The pendants can be used individually hanging as a kitchen table light or in a group, usually a line of three over a work surface this can often be more effective and cheaper than a kitchen island light, using your lighting in this way would make a suitable task light. Style is of course a matter of personal preference our retro pendant lighting shades come in a variety of styles to suit most tastes, so these pendants fit into both contemporary or traditional situations. Using kitchen ceiling light fixtures will give you ambient light. All our vintage looking kitchen light fittings come in a number of colours including traditional cream, chalk or bright white, mocha (putty grey) slate grey (darker) seaspray or satin matt black, with darker shades we suggest the inside is painted white for better light reflection. The ceiling rose and fittings are in aluminium with retro braided cable. Cables are 100 cm but you can specify longer if required. The colours in this group are matched to the Fisherman's Pendant and Fisherman's Wall Lights so you can mix and match if that suits you kitchen design. Our UK made Retro pendant lights from Great Lighting can add a quirky twist to the lighting in your home or business premises. Every light on this page connotes a classical charm that's right back in fashion. Retro ceiling lights are very on trend, and can be used as statement pieces to give your space a particular character. Available in a wide range of colours, there's something to suit any existing decor. Why UK Made, because we believe in buying British were we can, and these pendant lights have proved to be no exception to the quality and style we expect. So if you are looking to brighten up the kitchen or dining area, or having a complete refit we have a light shade that can suit. You only have to spend £50 for free UK mainland delivery.